The complete KG Bodywork's Buru bodywork kit. Comes with 2 Duo Evo side pods, a Buru front spoiler, Buru front panel, and Duo Evo side pod nerf bars in the color of your choice. KG Bodywork's Buru front spoiler. The CIK compliant front spoiler is 41" wide and is designed for maximum aerodynamic capabilities. The complete KG Bodywork's Buru plastics kit. Comes with 2 Duo Evo side pods, a Buru front spoiler, and a Buru front panel in the color of your choice. KG Bodywork's Duo Evo Side Pods. These side pods are a perfect fit for the KG Buru front spoiler. They require Duo Evo nerf bars for mounting. The Duo Evo side pods are a universal fit to either side of the kart. The KG Bodywork's CIK/11 Duo front spoiler is the perfect complement for the aggressive driver. The blunt front and wrap-around design allow the Duo nose to absorb heavy impacts without significant deformation. 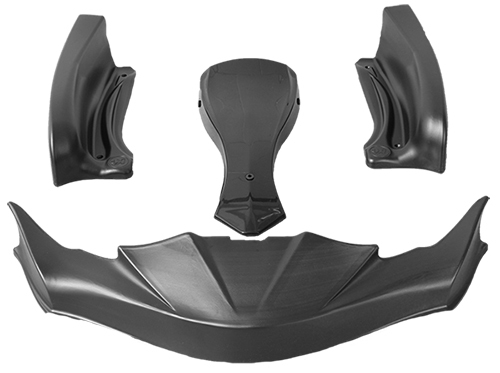 The KG Bodywork's CIK/11 Duo side pod is the perfect pod for the driver who wants a sculpted look and extra durability. The Duo pods shape and construction make it very resistant to impacts. This FP-7 front panel is CIK/17 homologated and is brand new for the 2013 season. It is much wider than previous KG panels and creates a much broader stance than any of the past panels. This FP-7 front spoiler is CIK/17 homologated and is brand new for the 2013 season. Dragging the nose on your current kart? No problem! The FP-7 front spoiler has three adjustable height positions to help get your bumper positioned where you want it. This FP-7 bodywork kit is the latest in bodywork from KG Bodywork and Accessories and is CIK/17 homologated. This kit comes complete with everything you need to update your bodywork kit, including the nerf bars and mounting hardware. This FP-7 bodywork kit is the latest in bodywork from KG Bodywork and Accessories and is CIK/17 homologated. This kit comes with the complete set of new plastics that should give your kart a fresh, updated look. This kit does not come with the panel mounting pins or the front spoiler mounting hardware kit.